I love pumpkin. And pumpkins. 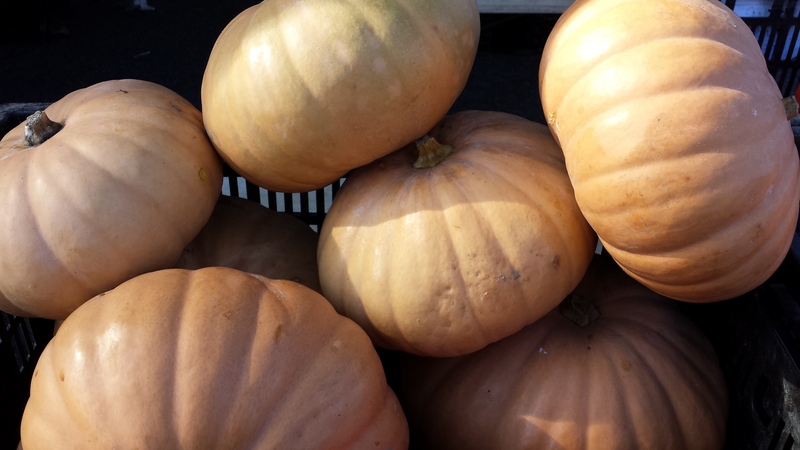 When they first appear at the farmers market, all orange and heavy and round, I shift into autumn mode. Apples instead of peaches. Broccoli rabe instead of garden salad. Braising instead of grilling. I fire up the oven, abandoned since the first blistering hot day of summer. With Thanksgiving a week away, we’re all thinking about pumpkin pie, of course. But the noble orb can do much more. You might not think about France when you think of pumpkins but they are all over the outdoor markets. 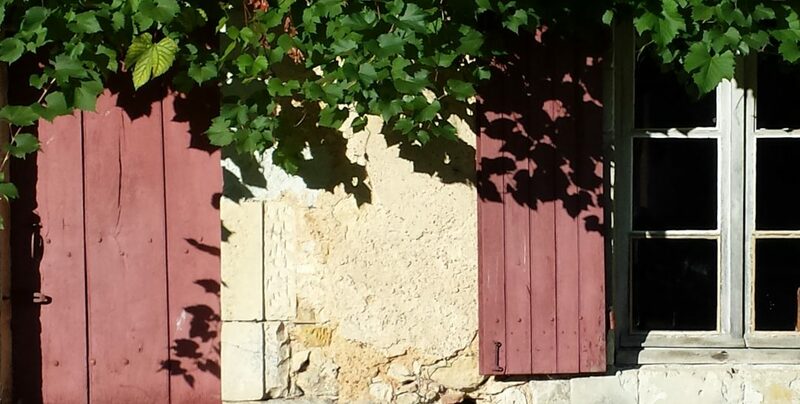 In fact, the French probably eat pumpkin in many more variations than we do here in the New World. A search of Cuisine Actuelle’s recipes for potiron (one of the French words for pumpkin) turned up Quiche au Potiron, Gratin de Potiron, Velouté au Potiron, Tarte au Potiron, even Frites de Potiron. 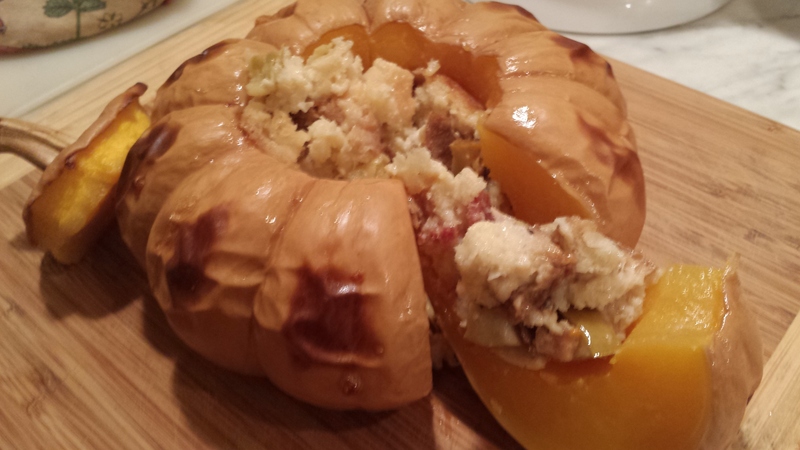 Years ago I found a recipe in The Vegetarian Epicure by Anna Thomas (reprinted in 2014) for Stuffed Pumpkin. The idea was intriguing but the recommended stuffing, an eggplant risotto, was a bit odd in my opinion. The recipe was filed away. Last year I bought Dorie Greenspan’s brick of a book, Around My French Table (a wonderful collection—go out and buy it now!) and turning one of the pages, what to my wondering eyes should appear but a gorgeous stuffed pumpkin. Dorie’s stuffing is a cheesy bread and bacon mixture that is a definite improvement over eggplant risotto. And it is sure to wow your guests. And when I make it. Not too bad, eh? I was very happy with her recipe, although next time I would add some caramelized onions to the stuffing mixture. The best thing about this is that it offers itself to endless variations. This week I‘m going to create something that embraces the spirit of Thanksgiving. Here’s my plan: to a base of mixed brown and wild rice I will add apples, sage sausage, and chestnuts. The pumpkins I bought this year are smaller and oblong-shaped so I plan to cut them in half lengthwise, roast the pumpkin halves first, then fill and roast them for about another 45 minutes. I’ll let you know how it turns out. Using a very sturdy knife—and being very careful—cut a cap out of the top of the pumpkin (like a Jack-o-Lantern). Cut off enough of the top to make it easy for you to work inside the pumpkin. Clear away the seeds and strings from the cap and from inside the pumpkin. Season the inside of the pumpkin generously with salt and pepper, and put it on the baking sheet. Peel the onions, then cut into large dice. Heat the oil and butter in a heavy bottomed pan large enough to hold the cut onions. Add the diced onions, turn heat to low, and gently stir the onions until they are soft and begin to caramelize. Remove from heat before they brown. Allow to cool slightly. In a large bowl combine the bread, cheese, bacon, onions, and herbs. Mix together the cream, eggs, and nutmeg and pour over the bread mixture. Stir to combine. Season lightly with salt and pepper, then pack the mix into the pumpkin. The pumpkin should be filled to the bottom of the opening. If needed, add some additional bread cubes and stir to incorporate with the rest of the mix. Basically, play it by ear and trust your judgment. You want a nice moist stuffing, not too dry, not swimming in liquid. Put the lid on the pumpkin and bake for about 2 hours—check after 90 minutes—or until everything inside the pumpkin is bubbling and the flesh of the pumpkin is tender enough to be pierced easily with the tip of a knife. Remove the lid during the last 20 minutes or so, so any excess liquid evaporate and the top of the stuffing can brown a little. When the pumpkin is done it will be heavy and wobbly. To serve, very carefully transfer it to a platter or a large cutting board and bring it to the table. 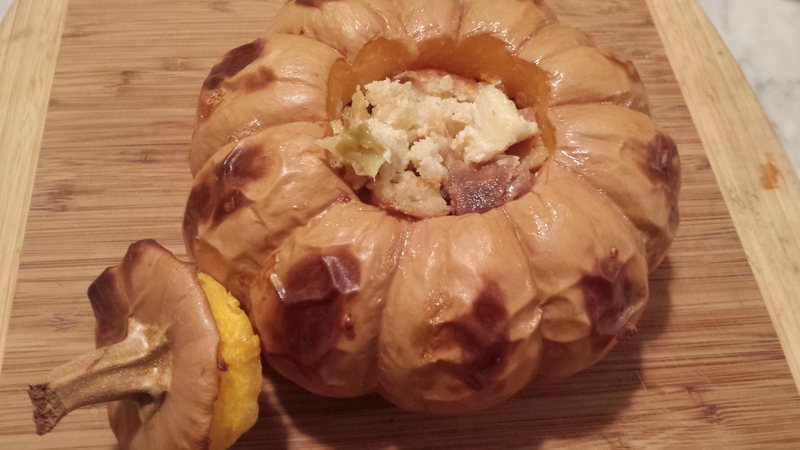 You can either spoon out some of the filling with some of the pumpkin, or carve it into thick slices with the bread stuffing, as pictured. I like the second way—it’s a celebration of pumpkin on a plate. This looks great, I’m going to give it a whirl! This looks fantastic. I love your idea for giving it a Thanksgiving twist. Please share the results with us. Happy Thanksgiving. Saute some shallots and herbs in of butter, add white wine vinegar and let reduce. Then add big fresh scallops, when slighty browned on each side, add white wine and let simmer just until scallops are barely cooked. Make a bechamel sauce, salt, pepper and curry to taste and add some freshly grated parmesan cheese. 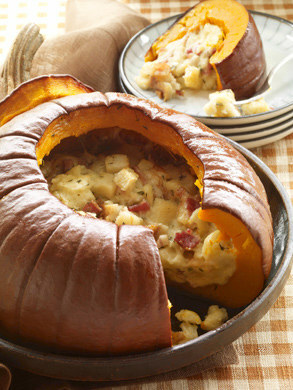 Add scallops and fill pumpkin that has been half baked and bake a little longer…. Some other spices like ginger or nutmeg? Mary – I love that idea. The curry and pumpkin will go together very well. I was going to try it but the diver for my fishmonger fell of the roof of his house and broke his shoulder. So no scallops for awhile. But it would work with leftover turkey, no? So I might try that next weekend.